Are you using Facebook to attract new constituents or inspire people to action? But as effective as it can be, Facebook continues to go through epic changes that can make it hard for many of us to keep up! While we’re not social media strategists, we do follow a number of non-profit subject matter experts so that we can keep our readers up-to-date on changes to social media that impact small non-profits and membership organizations. One of our key “go-to” experts is John Haydon. Not only does he write about, train and consult on social media for non-profits, he has now literally written (ok, co-authored) the book on Facebook! 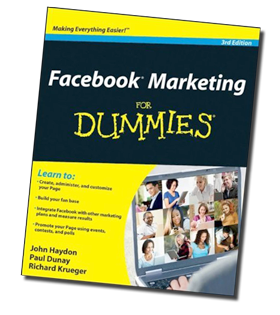 Facebook Marketing For Dummies – by Paul Dunay, Richard Krueger and John Haydon, (Wiley, 2012) – is hot off the press and chock-full of strategies, tactics, and techniques that will help you leverage the Facebook community and achieve your social media objectives. As Joanne Fritz (Guide to Nonprofit & Charitable Orgs at About.com ) notes, this book “is not specifically for nonprofits, but it does cover the basics of using FB whether you are a nonprofit organization or not. ...Facebook Marketing for Dummies takes you through the basics of setting up and customizing your organizational "Page" and provides a set of best practices. You'll also learn how to build your fan base, engage with readers, and incorporate your Facebook marketing with your other communications tools. Check it out: you can download a free chapter of Facebook Marketing for Dummies here. It’s a good idea to have a guidebook at hand to keep up with Facebook. In fact, as you’re probably aware, there is another major change coming to Facebook soon. As of March 30, 2012, all Facebook Pages will be upgraded to the new Timeline layout. You can watch John Haydon's video tutorial: How to Convert Your Facebook Page Over to the new Timeline Layout - here.